Talk Talk was an English musical group, active from 1981 to 1991. The group had a string of international hit singles including "Today", "Talk Talk", "It's My Life", "Such a Shame", "Dum Dum Girl", "Life's What You Make It" and "Living in Another World". In their later years the band's commercial appeal receded, and their critical reputation increased as they moved from synthpop to a more experimental form. Their last two albums, Spirit of Eden and Laughing Stock, were highly acclaimed and remain influential to experimental alternative rock genres. 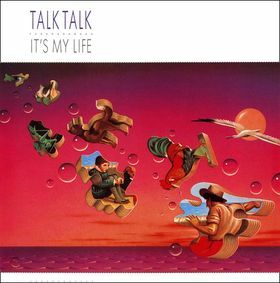 Talk Talk began as a quartet consisting of Mark Hollis (vocals), Simon Brenner (keyboards), Lee Harris (drums) and Paul Webb (bass guitar). They were generally associated with the New Romantic movement; more specifically, in their early years, they were often compared with Duran Duran, as both bands not only featured a double-barrelled name and a Roxy Music-inspired musical direction, but also shared the same record label (EMI) and producer (Colin Thurston). Talk Talk disbanded in 1992. Paul Webb rejoined Lee Harris, and the two went on to form the band .O.rang, while Tim Friese-Greene started recording under the name Heligoland. In 1998, Mark Hollis released his self-titled solo début Mark Hollis, which was very much in keeping with the minimalist post-rock sound of Spirit of Eden and Laughing Stock. Hollis retired from the music industry shortly afterwards. It's My Life was the second studio album by Talk Talk, released in 1984. It was a Top 5 hit album in several European countries, thanks to the big international success of its singles (notably "Such a Shame"), but it only reached #35 in the UK Top 40 chart. In the US, the album just missed the Top 40, reaching #42.